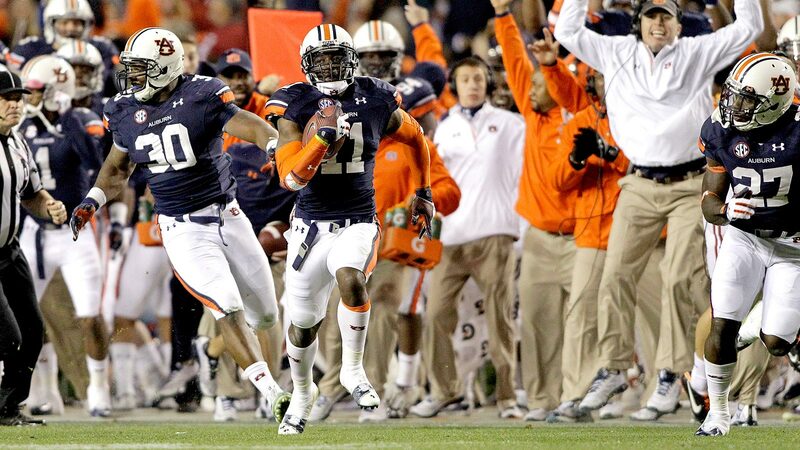 Chris Davis returns a missed field goal 109 yards to give Auburn and improbably victory over Alabama. The Iron Bowl is one of the biggest rivalries in college football. The fans of Auburn and Alabama do not like each other and each fan base wants bragging rights to the state of Alabama for a year. This is probably one of the most anticipated matchups in the rivalry with the Alabama Crimson Tide coming in ranked #1 in the country and the Auburn Tigers ranked #4 in the country. The winner of the game would go into the SEC Championship Game and have a chance to win the national championship. Alabama has won 3 of the last 4 national championships and came into the game undefeated. Nick Saban has created a powerhouse in Tuscaloosa and they are a tough team to beat. Texas A&M had been the only team to really challenge the Crimson Tide all season. The Auburn Tigers did not win a single SEC game in 2012. They fired Coach Gene Chizik and hired former offensive coordinator Gus Malzahn as the head coach. The team has taken off since the hiring of Malzahn. Part of the reason is due to better play at the quarterback position. Malzahn put former Georgia cornerback Nick Marshall into the starting lineup and the team has taken off. Marshall gives them the ability to not only run the option, but also pass off of it which he does very well. I cut my teeth on the wishbone offense and I love to see how people are still running the option, yet giving it a twist to make it new. Alabama received the opening kickoff. On the first play from scrimmage, sophomore running back T.J. Yeldon broke a 31 yard run to the Auburn 45 yard line. A pass to sophomore receiver Amari Cooper game them a first down at the 34 yard line. The Tigers defense held and forced Alabama to attempt a 44 yard field goal which was missed by Cade Foster. Later in the quarter, Marshall put the Tigers on the board first with a 45 yard touchdown run. The 1st quarter ended with Auburn on top 7-0. Alabama tied the score on their first possession of the 2nd quarter. Using mostly the passing of senior quarterback A.J. McCarron, they drove into the red zone. McCarron’s 3 yard pass to fullback Jalston Fowler tied the score at 7-7. A fumble by Auburn running back Tre Mason gave Alabama the ball right back at the Tiger Auburn 36 yard line. Sophomore safety Landon Collins stripped the ball from Mason and then made the recovery. T.J. Yeldon moved the ball to the 20 yard line with one catch and two runs. From there, McCarron hit senior receiver Kevin Norwood for the touchdown to give the Crimson Tide a 14-7 lead. After forcing an Auburn punt, Alabama one again had good field position at their own 44 yard line. A 14 yard pass from McCarron to Norwood and a 28 yard run by Cooper put the ball at the Auburn 1 yard line. From there, Yeldon took it in to extend the Crimson Tide lead to 21-7. The Tigers had one last shot before half time and they made it count. Tre Mason took the team on his shoulders. He had runs of 8, 40, 10, 6 and 1 yard to put the ball at the Crimson Tide 16 yard line. Marshall then ran for 15 yards to put the ball at the one and Mason put the ball into the end zone to trim the lead to 21-14 at the half. Auburn received the 2nd half kickoff and was able to tie the game. Using the legs of Marshall and Mason, they moved the ball into scoring position and then Marshall completed a 13 yard strike to junior tight end C.J. Uzomah for the score. Neither team was able to threaten for the rest of the quarter and the game went into the last quarter tied at 21. The 4th quarter ended up being one of the most entertaining quarters of the any game this year. A long Crimson Tide drive ended with a missed field goal by Foster. Auburn’s possession stalled at the Alabama 47 yard line and they pinned the Crimson Tide deep by downing a punt at the 1 yard line. However, the momentum was short lived. On the first play, McCarron dropped back to pass in his own end zone and lofted a pass to Cooper. Cooper made the catch, broke a tackle and raced 99 yards for a touchdown to put Alabama on top 28-21. On Auburn’s next possession, they tried to seize momentum by going for it on 4th and 1 at their own 35 yard line, however, Marshall was stopped short and the Crimson Tide had excellent field position. Alabama was not able to capitalize as they also went for it on 4th and 1 at the Auburn 13 and Yeldon was stopped short. The Crimson Tide defense forced a punt and junior receiver Christion Jones returned the punt to the Auburn 25 yard line. Once again, the Auburn defense stood tall and this time Alabama attempted a 44 yard field goal which was blocked by junior defensive tackle Gabe Wright, giving the Tigers the ball at their own 35 with 2:41 left in the game. Tre Mason ran the ball six times to put the ball at the Crimson Tide 39 yard line. On 1st and 10, Marshall ran to his left on the option and just before he crossed the line of scrimmage, flipped a pass to a wide open Sammie Coates who took it to the house, tying the game at 28 with 0:32 left. A 24 yard run by Yeldon moved the ball to the Auburn 38 yard line. Initially it was called that the clock ran down to 0:00 on the run, but on review it was ruled there was 0:01 left. Alabama brought on freshman kicker Adam Griffith to attempt a 57 yard field goal. The kick was short and was fielded by Auburn senior corner Chris Davis who had stationed himself in the end zone. Davis caught the ball 9 yards deep in the end zone and began to return the ball to his left. A wall formed and Davis ran down the left sideline then broke to the middle, racing 109 yards for the touchdown and giving Auburn an unbelievable 34-28 win. The last four winners of the Iron Bowl have won the national championship and this makes it back to back crazy, improbable wins for Auburn. You have to wonder if they are a team of destiny. The win moves them to #3 in the BCS standings and into the SEC Championship Game against #5 Missouri. If they truly are a team of destiny, they will have to first beat Missouri. They will then either need Florida State or Ohio State to lose in their championship games this weekend or hope that a win over Missouri would be enough to push them past Ohio State in the BCS rankings. Alabama had several shots to win the game, but just could not close it out. They missed 4 field goals that would have easily put the game away. The loss knocked Alabama out of the SEC Championship Game. They could possibly make it into the BCS Championship Game, but they will need a lot of luck. The loss dropped them to #4 in the BCS standings. They would need both Ohio State and Auburn to lose in their championship games to have a shot at making it back to their 4th BCS Championship game in five years. Nick Marshall, QB, Jr: Good speed and extremely athletic. Former Georgia cornerback. Was highly recruited as a high school defensive back. Very good runner that is still learning to be a passer. Magician running the option. Very good at passing while running the option. Dangerous once he gets outside the pocket. Very good leadership skills and has an ability to rally his team from behind. Completed 11/16 for 97 yards and 2 TD. Had 17 carries for 99 yards and 1 TD. Had a 45 yard TD run. Completed an amazing 39 yard TD pass off of an option look. Missed a wide open receiver on 4th and 4. Tre Mason, RB, Jr: Key to the Tiger offense. Game breaking speed. Does a good job running it between the tackles. Able to break tackles. Willing to lower his shoulder and take on tacklers. Able to return kicks. Carried 29 times for 164 yards a 1 TD. Jay Prosch, FB, Sr: One of the best fullbacks available for the draft. Tough and hard-nosed. Very good lead blocker. Good overall football player. Coaches love him. Quan Bray, WR, Jr: Good athleticism. Good vertical jump. Plays on special teams and downed a punt at the 1 yard line. Had 2 catches for 60 yards, including the 39 yarder that tied the game with 0:32 left. C.J. Uzomah, TE, Jr: Able to line up in the slot. Was a quarterback in high school. Able to go up and catch the ball at its highest point. Marshall likes to look for him in the red zone where he can use his size to create mismatches. Had 2 catches for 22 yards and 1 TD. Reese Dismukes, C, Jr: 3 year starter. Stout at the point of attack. Does a good job sealing off defenders. Good drive blocker. Dee Ford, DE, Sr: Good pass rusher, but had a quiet game. Had 1 tackle, ½ tackle for loss and 2 QB hurries. Offsides on 4th and 1 which gave Alabama a 1st down. Gabe Wright, DT, Jr: Hard to run against. Gets good inside pressure on the passer. Had 4 tackles, 1 ½ tackles for loss, 1 sack and 2 QB hurries. Blocked a FG which allowed his team to rally from behind. Jonathon Mincy, CB, Jr: Tackles well in space. Was beat bad on the 99 yard touchdown. Had 4 tackles and 1 pass breakup. Chris Davis, CB, Sr: Able to cover slot receivers. Very good returner. Helps out in run defense. Had 10 tackles and probably the play of the year in college football with the 109 yard return of the missed field goal. Ryan White, S, Sr: Beat on a 54 yard catch. Had 2 tackles. Jermaine Whitehead, S, Jr: Missed a tackle on the 99 yard touchdown catch. Had 9 tackles and 2 pass breakups. Robenson Therezie, S, Jr: Good tackler. Comes up quick on underneath plays. Had 4 tackles and 1 tackle for loss. A.J. McCarron, QB, Sr: Experienced and efficient. Takes care of the ball. Only has 3 losses as a starter. A win would have made a case for him for the Heisman Trophy. Plagued by drops by his receivers. Completed 17/29 for 277 yards and 3 TD. Carried 4 times for 16 yards. Jalston Fowler, FB/TE, Sr: Versatile. Can block, catch and even run the ball occasionally. Had 1 catch for 3 yards and 1 TD. DeAndrew White, WR, Jr: Quick feet. Good special teamer. Had 2 catches for 13 yards. Kevin Norwood, WR, Sr: Experienced and dependable. Good chemistry with McCarron. Good hands. Had 3 catches for 45 yards and 1 TD. Christion Jones, WR, Jr: Used more as a returner than as a receiver. Very good return skills. Had a 19 yard punt return. Had 1 catch for 7 yards and dropped 1 pass. Cyrus Kouandijo, OT, Jr: Moves well for such a big man. Able to get out on screen plays. Had a false start penalty. Ed Stinson, DE, Jr: Good against the run, but not a great pass rusher. Does a good job getting his hands up on the pass rush. Had 5 tackles and 1 batted pass. Adrian Hubbard, OLB, Jr: Good balance, flexibility and forward lean on pass rush. Takes on blockers, sheds them and makes the tackle. Had 6 tackles, 1 tackle for loss, 1 sack and had a big stop on 4th and 1. Trey DePriest, ILB, Jr: Had a good game. Good run stuffer. Does a good job blitzing the A gap. Had 11 tackles, 1 ½ tackles for loss, 1 sack and 1 forced fumble. This entry was posted on December 4, 2013 by draftmaniacs in Scouting reports and tagged 2014 NFL draft, A.J. McCarron, Alabama football, auburn football, Chris Davis 109 yard return, NFL, NFL Draft, Nick Marshall, Roll Tide, War Eagle.